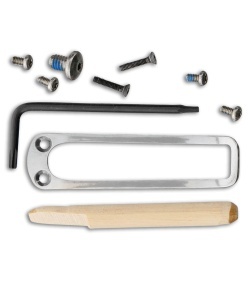 Add an upgrade to your Hogue EX-02 with this satin torx screw and pocket clip kit. It includes 7 torx screws, a stainless steel pocket clip, allen wrench, and a wood dowel to assist in installation. Compatible with the 3.3" or 3.75" version of the Hogue EX-02.